These two transducer technologies provide great industrial metrological solutions. They are widely used across different industries for almost the same applications; however, there are differences between them which includes: performance factors such as resolution, accuracy, and susceptibility to environmental errors; utilization factors such as ease of measurement, signal transmission, equipment interfaces, and physical characteristics. This article discusses the various points that compare and contrast these two types of sensors; the information will be very useful to system designers in selecting components for various applications and also for educational purposes of instrumentation and control systems. A strain gauge sensor works by transforming the quantity to be sensed into an elastic deformation of the strain gauge. These quantities could be static or dynamic load, weight, force, acceleration, and pressure. This deformation under the influence of the load causes a change in the dimensions of the strain gauge material; the deformation then causes a resultant change in the electrical resistance of the strain gauge material. The changes in electrical resistance are thereby indicative of the magnitude of the applied force. The mathematical formula that relates the changes in dimension to change in length is shown below. The changes in resistance are then measured by transforming it to an equivalent change in voltage. 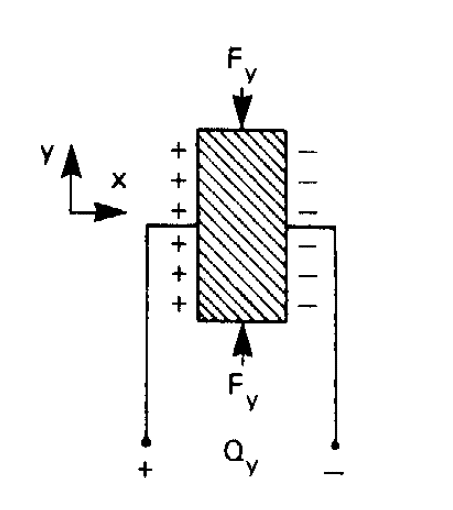 A Wheatstone bridge setup is the most commonly used technique for a change resistance to a change in voltage transformation. The strain gauge(s) is/are included into one or more arms of the Wheatstone bridge so that changes in its resistance under physical loading causes a change in the voltage at the output terminals. The mathematical formula for a quarter-bridge configuration – shown in figure 1 below – is expressed below. 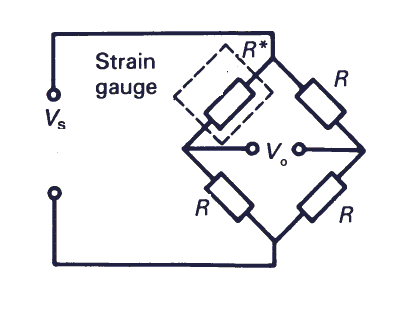 Here dR is the change in resistance of the strain gauge. This output voltage is very small (mV), hence the output analog voltage signal is always passed through a signal conditioning circuit that amplifies and filters it. Therefore, basically, the strain gauge sensor detects the physical force and produces an electrical output that is proportional to the load. A piezoelectric sensor makes use of a piezoelectric material that transforms the quantity to be sensed into an electric charge. The quantity of the electric charge is thereby indicative of the magnitude of the applied load. The piezoelectric material acts like a mechatronic component: it deforms elastically and mechanically under the influence of the applied load in order to cause a disorientation of the dipoles within its crystalline structure; therefore, an electrode that is appropriately connected across the surfaces of this piezoelectric material will sense the movement of electric charges. This shown in figure 2 below. The mathematical formula for the amount of charge produced is expressed in the formula below. The electrical charge between the electrodes is then supplied to a charge amplifier. The amplifier, depending on the system design, could either see the piezoelectric sensor as a charge source or a voltage source. The former is most preferred and it involves the use of an operational amplifier; this helps to overcome the effects of stray cable, sensor, and amplifier capacitances. Also, with modern microelectronic techniques, the charge amplifier can be embedded inside the transducer to shorten the gap between the electrode and the amplifier. Furthermore, there are charge leakages caused by the internal resistance component of the material. This resistance is very large, hence developed charges decay after a period of time; the charge amplifier caters for this by shortening the decay period. The voltage output of the amplifier can then be processed by analog or digital techniques to indicate the sensed quantity. Also, a piezoelectric sensor can also act as a piezoelectric actuator in a process called the reverse piezoelectric effect. This effect is observed when there is a supply of alternating voltage to the sensor, the piezoelectric material starts to vibrate. Strain gauge sensors use the strain gauge element as the underlying mechanism; the types used include thin-film, foil, and semiconductor strain gauges. They are made from materials such as copper-nickel, nickel chromium, platinum-tungsten alloys, and silicon. 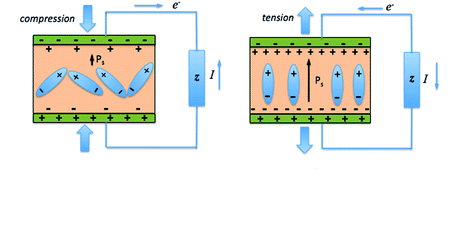 Piezoelectric sensors use a piezoelectric material as its underlying mechanism. These materials can be naturally occurring crystals like Rochelle salt and quartz. They could also be synthetically made materials which are of two types: crystalline types such as Lithium Sulphate and Ammonium Di-Hydrogen phosphate, and polarized ferroelectric ceramics such as Barium Titanate. Bonded strain gauges are fabricated by attaching the length of the conductive strip to a thin backing. This process is called micromachining, in which the additive material – such as silicon, for a semiconductor strain gauge – is placed on a substrate – a non-conductive thin backing made from polymers. This process usually involves deposition of conductive materials on thin films, patterning which arranges the conductor in a grid pattern, and etching to remove the patterned parts. The strain gauge is then carefully bonded to the surface of the sensors structural element by agents like adhesives; to properly perform bonding, the surface needs to be prepared through the steps of cleaning, smoothing, roughening, and marking. The bonded strain gauge is then protected against external mechanical and chemical damages by hermetic sealing. It should be noted that there are also non-bonded strain gauges but the common and widely used is the bonded type that is easily embedded and compact. Natural piezoelectric materials like quartz simply need to be cut by very fine precision tools to the required dimension that fits the application. However, these natural single crystal materials have very bad crystal stability and a limited degree of freedom. The synthetic piezoelectric materials like ferroelectric ceramics have randomly oriented internal electrical dipoles within their crystal structure. Therefore there is a need for them to be polarized; the process to this is called poling. Poling is done by firstly heating the potentially piezoelectric powder material to a temperature level higher than the Curie point. The ferromagnetic properties of the crystal break down at this Curie point temperature. The next step to polling is then to apply a strong DC electric field of several kV/mm to the heated material and allow it to cool under this field. The result is the polarization of the material: the redistribution of the dipoles in the direction of the applied field. Hence a strong piezoelectric property is formed. After cooling the electric field is removed and the material maintains the dipole orientation. Figure 3 below explains this better. The most important thing that is considered during poling is the geometry of the crystal, especially when applying the electric field; this greatly affects the sensitivity of the material. 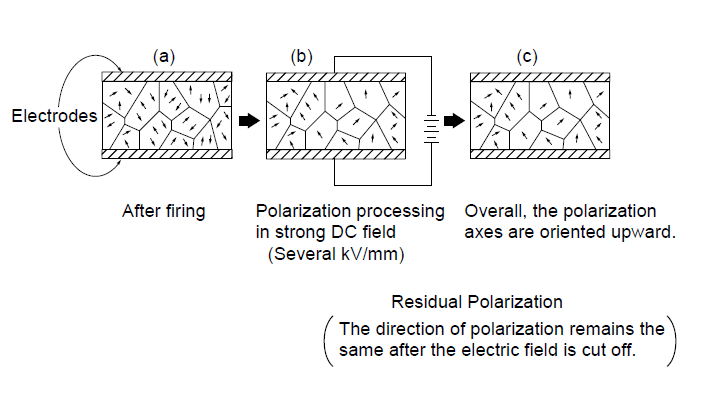 The polarized material is later supported by a substrate which could also serve as the outer electrode of the piezoelectric sensor. The material is fixed such that the direction of application of the deforming stress is perpendicular to the direction in which charges are generated – that is the location at which the electrodes are placed. This is shown in figure 4 below. Strain gauge sensors can be categorized based on the geometric shape of the structural housing unit to which the strain gauge(s) is/are fixed. This can be in the forms of a beam, S-shape, disc canisters, and planar beams; the piezoelectric sensors can also be designed to be housed in these types of shapes, it all depends on the application requirements. Both types of sensors can be used for multi-axial applications, they can support compression, shear, or bending stresses. Piezoelectric sensor designs in comparison to strain gauges’ are compact, small, and have a rugged construction. The Force Range: This includes the rated capacity. The force range of the piezoelectric sensor is about 5KN to 1MN while the strain gauge sensors have a range of 5N to 40MN. Loading Conditions: Piezoelectric load cells can only support dynamic loads such as vibrations, accelerations, and dynamic pressure measurements; strain gauge load cells can support both static and dynamic loads. Creep: strain gauge sensors have very low and insignificant drift in output when subjected to a load for a long time; piezoelectric sensors have very large drift in output value which results in errors for long time measurements. Stiffness: piezoelectric sensors have very high stiffness value. Resonant Frequency: Unlike strain gauge transducers, piezoelectric sensors have a higher resonant frequency due to their stiffness. This value can be as high as 100,000Hz. Sealing: both sensors types are designed to have very excellent seals which offer a high degree of protection and operational safety in harsh environments. The most common sealing technique is the hermetic seal. Temperature Effects: Both sensors are very sensitive to temperature changes as it affects the zero-balance, sensitivity, and linearity. However, various compensation techniques are utilized in the design of each: strain gauge sensors use self-temperature compensating gauges; the piezoelectric sensors are able to cater for temperature effects by the integration with a charge amplifier. Repeatability: both sensors can be designed to achieve excellent repeatability. Linearity: strain gauge sensors have a lower linearity error in comparison to piezoelectric sensors. Sensitivity: The sensitivity of the piezoelectric sensor depends on the material used and its geometry; it is rated in Pico Coulombs per Newton (pC/N). Strain gauge transducer’s sensitivity depends on the excitation voltage and the rated capacity value; it is rated in millivolts per volts (mV/V). The two force transducers are of undeniable importance and any can be used depending on the requirement of the process they are to be applied to. Furthermore, calibration of these devices is also necessary as it yields a calibration line and can greatly improve the accuracy of measurements by removing systematic errors. In summary, piezoelectric sensors offer excellent dynamic measurements while strain gauge transducers – the most commonly used of the two – offers excellent dynamic and static load measurements. The Instrumentation Reference Book, Edited by Walt Boyes. Jayant Sirohi, Inderjit Chopra , “Fundamental Understanding of Piezoelectric Strain Sensors,” Journal of Intelligent Material Systems and Structures. Force Measurement Glossary by Tacuna Systems. Load Cell Material by Tacuna Systems.